The harping cousins are back with another duet book! 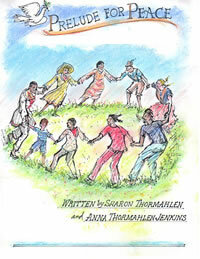 Sharon Thormahlen and Anna Thormahlen Jenkins, are excited to share their new creation with you! Under the Double Rainbow is a unique set of harp duet arrangements that includes 3 of their original compositions along with Over the Rainbow and La Chanson de Claudine. Sharon and Anna blend their individual expertise and creativity into five duets that are both fun to play and engaging for an audience to hear. 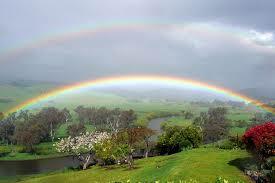 There is a story behind every book, and here is the scoop on Under the Double Rainbow! After completing their first book, Cabin Fever for Two, Anna and Sharon couldn't help arranging more tunes whenever they had a few days together. On one rainy fall afternoon they were at Sharon's home in Corvallis, Oregon. 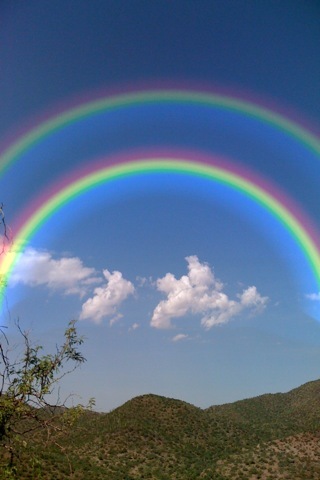 When sunshine coming through the window drew them outside, they looked up in the sky and saw a double rainbow! As they admired it, Anna turned to Sharon saying, "We're standing under the double rainbow…that sounds like the name of a song." Sharon quickly replied, "It sounds like the name of our next duet book!" This arrangement of Over the Rainbow not only includes the beautiful but rarely-used introduction by Harold Arlen along with his classic tune, it incorporates the universally popular version by Israel "IZ" Kamakawiwo'ole. La Chanson de Claudine is a beautiful tune written by Claudine Longet and Mason Williams of Classical Gas fame. The arrangement's slow tempo, use of harmonics and triplets, and clustered color chords make this an elegant duet. Hermosa Mariposa went through some other hands before emerging in its current form. It started with ideas from Kim Robertson's "Sandwich Workshop," then moved into improvisation with Sharon's friend, Jory Aronson. The "beautiful butterfly," whose journey is told here in music, came to rest in this composition completed by Sharon and Anna. After initially composing Prelude for Peace as an ensemble work for harp, handbells, multi-instruments, and singers, Sharon and Anna re-wrote this for two harps. Still included are full chords reminiscent of handbells, the melody and words from the hymn at its core, and interesting variations on the stated chord progression. This duet, written to express a hope for peace in the world, is close to their hearts. 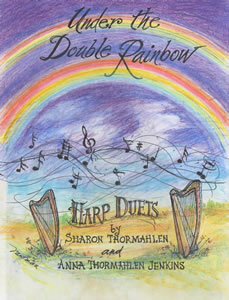 The tune Under the Double Rainbow goes way back with a little story attached: After a week-long harp retreat in Ukiah, CA where Sharon and Anna were visiting Marian Thormahlen (Sharon's mother-in-law and Anna's aunt), they packed up their car and began the trip home. But first these Northwesterners had to stop at Starbucks! While there, they checked the weather forecast: big storm brewing for the Siskiyous. This mountain pass can be treacherous, so they turned around and stayed another day in the lowlands. That lovely day was filled with picnicking, wine tasting, pottery shopping, gentle rain and sun breaks, and music composing. The beginnings of an experimental tune emerged, and they knew it was something special. Although unfinished, they titled it The Gift; the gift of another day to play their harps together! They also pledged to let this work emerge in its own time. It took a few years, but it evolved as a tone poem and became the title tune for this book. Sharon and Anna hope you use this book with your harp circles, ensembles and harp buddies, and they, also, hope you enoy this book!